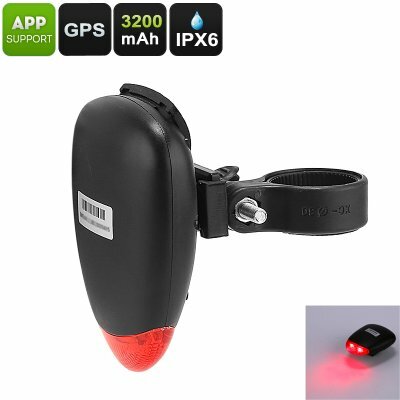 Successfully Added GPS Tracker Tail Light - App Support, IPX6 Waterproof, 3 Light Modes, 3200mAh Battery, 10M GPS Accuracy, 1 IMEI to your Shopping Cart. This LED tail light is so much more than a regular bike light. This cool gizmo features a SIM card slot and 1 IMEI number which provides it with full GPS functionality. When used with the dedicated smartphone Application, it allows you to track your cycling routes. Additionally, it lets you keep track of your bike even when you’re not around. The GPS tracker has a 10-meter accuracy thanks to which you’ll always be able to find its current location. From now on, you’ll always be able to find back your bike in case it got lost or stolen. When used for its regular tail light functions, this bike light supports different lighting modes. Therefore it will significantly increase your safety on the road. It comes with a powerful 3200mAh battery that provides you with up to 500 hours of usage time. Thanks to this, you won’t have to worry anytime soon about recharging its batteries. The light is IPX6 waterproof and can be used efficiently in any weather condition. With this cool bike gadget, you’ll be able to track your routes, find back your bike, and make your presence known to fellow bikers after dark. This makes it the ultimate gizmo for on your bicycle. This GPS tracker comes with a 12 months warranty, brought to you by the leader in electronic devices as well as wholesale electronic gadgets..
Support for operating system: Apple 7.0 or above, Android 4.3 above.